Powers/Abilities: The Tyrannosaurus had all the attributes common to others of its species, with the exception that it had a phenomenal growth rate, able to go from a hatchling to a full-grown adult in the span of a few hours. History: (Tales of Suspense I#5/2) - Rod and Kate, a married couple on vacation in Africa, were at a village near the seacoast town of Boezeke. They noticed a small island off the shore and wanted to explore it, but the tribal chief warned them that is was taboo, a great evil place. Disregarding the chief's warnings, the couple borrowed a boat from the natives and rowed to the island. They found a cave entrance and went inside to explore, where they discovered a giant dinosaur egg frozen in the damp cavern. Thinking he could sell the egg to a museum and make enough money to pay for their trip, Rod rolled the egg into the boat and they paddled back to the mainland. They unloaded the egg on the beach and left it there to get some natives to help them haul it back to the village. But the egg was left for hours under the hot sun. It hatched open, and a Tyrannosaurus emerged looking for food. The dinosaur's keen nostrils led it to the village, but it was continuously growing as it went along -- by the time it reached the village, it was twice as large as the egg it hatched from. It caused a panic amongst the natives, then lumbered into the jungle to stalk the animal life, growing even larger by the hour. Rod felt responsible for the menace, and felt it was up to him to stop it. Despite Kate's tearful pleas, Rod went off to find the dinosaur. As he tracked it through the jungle -- a rather simple and terrifying task, considering it had already reached full size -- Rod was armed only with a rifle, and felt he really didn't stand a chance against the great reptile. When he caught up to the beast, Rod ran to the edge of a ravine and cut a vine loose. When the Tyrannosaurus charged him, the ledge gave way under the dinosaur's weight. As Rod was left hanging on the end of the vine, he watched as the Tyrannosaurus hurtled downward, followed by an avalanche of rocks. When Rod was reunited with Kate, they both felt badly for what had happened to the Tyrannosaurus, but they thought that it was for the best because the dinosaur had no place in the modern world. Comments: Created by an unknown writer and Steve Ditko. In regards to the Tyrannosaurus's incredible growth rate -- I'm no dinosaur expert, but it does seem rather peculiar to me that it could reach full maturity in a matter of hours. So I'm going to write this one off as being a Deviant mutate specifically bred with accelerated growth (and that would explain why the native chief thought the island was "a great evil place" -- it was once a Deviant outpost). 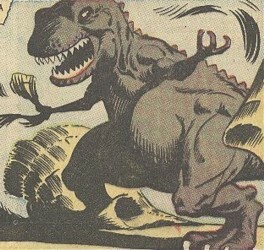 In the Monster Hunters storyline in Marvel Universe #'s 4 - 7, it was revealed that Warlord Kro of the Deviants was responsible for some of the monsters of the world, including Gorgilla and the tyrannosaur Gorgilla fought. The android Human Torch and Toro once fought a giant tyrannosaur-like dinosaur in Human Torch I#36 (April, 1954) -- maybe Kro was behind that one, too. Here's a wild thought -- I wonder if Rod could be an unknown son of Ulysses Bloodstone -- being around for 10,000+ years, he was bound to have fathered more children than just Elsa; maybe when Rod fought the Tyrannosaurus, he was just carrying on a "family tradition". 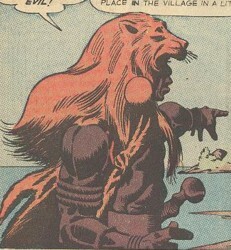 The tribal chief -- could he be one of the worshippers of the Lion God (and a potential rival of the Black Panther)? In Mystic Comics 70th Anniversary Special #1 (October, 2009) reprinting Marvel Mystery Comics#16 (February, 1941) Vision story circus owner Barney Baily (possibly named after Barnum And Baily Circus) bought 2 dinosaur eggs from a man named Smith who found them in Siberian ice. Mr.Baily hatched them (a Tyrannosaurus and a Gigantosauros, a Sauropod)---no mention of if they grew to adulthood as fast as this Tyrannosaurus. It occurred to me that Smith could be Kro and he or other Deviants could be behind other egg finds--Pre-History, Tyrannosaurus and the Roc. I give credit to John Kaminski for suggesting the Deviants in his Tyrannosaurus profile. And a big THANK YOU to Dennis Giansante for scanning this story for me! A married couple on vacation in Africa, they discovered a giant dinosaur egg in the caves of a forbidden island. The ruler of the unnamed tribe that dwelled in a small village in Africa, he wore the head of a lion. His village was attacked by the Tyrannosaurus when Rod and Kate inadvertently caused it to hatch from its egg.